Tailor this trip to your style and budgey with our fine choice of city-center hotels. Travel through the Chunnel aboard the Eurostar Train from London to Paris… with private rail station transfers to make your travel truly carefree! Our included hop-on/hop-off sightseeing tours in both cities make it easy to see all the sites on your list. Enjoy a cruise on the Thames and ride the London Eye. Ride the buses and subways for free with our included transport passes in both cities. Gain free entry to the top sites of Paris with our 2-day Museum Pass. Our signature flexibility and included features promise a more rewarding and carefree vacation in these two delightful cities! Day 1 – Welcome to London! Check in to your choice of air-conditioned, city-center hotel. Both have been carefully selected for their hospitality and convenient city-center locations. Your 2-day London TravelCard is good for unlimited travel on the city’s buses, subway and trains. See the sites with the Original London Sightseeing hop-on/hop-off bus, including a Thames cruise plus ticket for the London Eye, the world’s largest observation wheel. You have this entire day at leisure to enjoy as you wish. London is a friendly, accessible city and your hotel’s heart-of-it-all location makes it easy to step out and explore at your own pace. Don’t forget, travelers come from all over the world just to attend the theater, perhaps London’s greatest love. Your hotel concierge can help arrange tickets. Transfer to the station to board the Eurostar for your rail journey through the Chunnel to France – the undersea link between Britain and France. 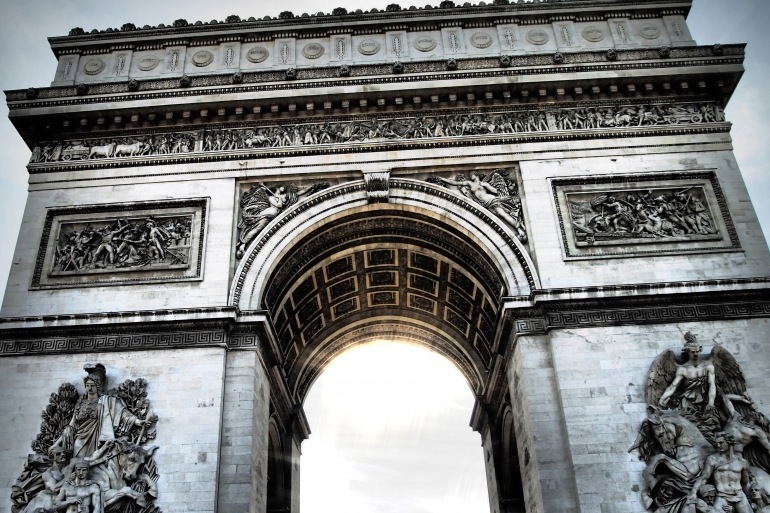 Upon arrival in Paris, you’ll be met and escorted to your choice of city-center, air-conditioned hotel. See the city’s landmarks with convenient hop-on/hop-off sightseeing and get around town for free with a 2-day Paris Visite Pass. Your 2-day Museum Pass gains entry to more than 60 museums and sites. Day 6 – Paris as you please! Take advantage of your Museum and Visite Passes. Day 7 – Au revoir, Paris! Your tour with us finishes today. This affordable, easy-to-add Post Trip extension includes all on-tour transportation; 6 nights in your choice of hotels in Rome, Florence and Venice; daily breakfast; and sightseeing. We include everything for a perfect stay in one of Europe’s most enchanting and romantic cities! Choose from our outstanding heart-of-it-all hotels and set out with our engaging resident guide on a private walking tour featuring St. Mark’s Square, the Doge’s Palace and more. 30 minutes from Heathrow Airport and 1 hour from Gatwick Airport. The stylish West End London hotel is within walking distance of the British Museum, Covent Garden and Oxford and Regent Streets. This comfortable hotel is situated between the Financial District and world-famous attractions like Soho and the theatre district. Expect excellent service from the friendly multi-lingual staff and a signature, warm DoubleTree chocolate chip cookie. A first class hotel in the area of Madeleine, near Fauchon and a multitude of marvelous shops, this 27 room town house is a quiet, stylish haven. Very well designed, you’ll enjoy the convenience and sophistication of this charming hotel. Overlooking the lush greenery of its own private garden, this Victorian jewel with 154 elegant air-conditioned rooms is located on a quiet street just a stone’s throw from Earl’s Court, shopping and the Victoria and Albert Museum. A buffet breakfast is served every morning. Located on the left bank of Paris, the K+K Cayre Hotel has been completely renovated in recent years. A favorite with our travelers, all 125 guest rooms have air conditioning, satellite TV, radio, mini-bar, telephone, and internet access. Other hotel amenities include the multilingual staff, a breakfast buffet, hotel-wide WiFi internet access, lounge, sauna, bar, and health room.